Perhaps I wasn’t aware t hat it would be such a search for a good toddler book. Maybe because there is an entire floor at the library dedicated to children’s books and endless “recommended” books for toddlers. Have you read these books? Many are boring, not written well, illustrations are odd, story is too scary or too deep for a toddler, hard to read, too long, etc. etc. When I bought The Magic Hockey Stick book by Peter Maloney, I thought it would be more of a sports book but it isn’t at all. The book has wit, it rhymes (but not the cheesy rhyming) which makes it easy to read, it isn’t too long, the story is so good – I even got teared up a little but it isn’t sad, and best of all, my kid loves it. I’m searching out other Peter Maloney books and will let you know if they are just as good. 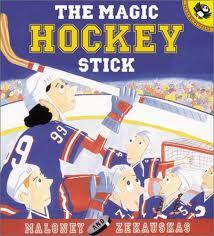 The Magic Hockey Stick is available at Amazon.com for $5.99.